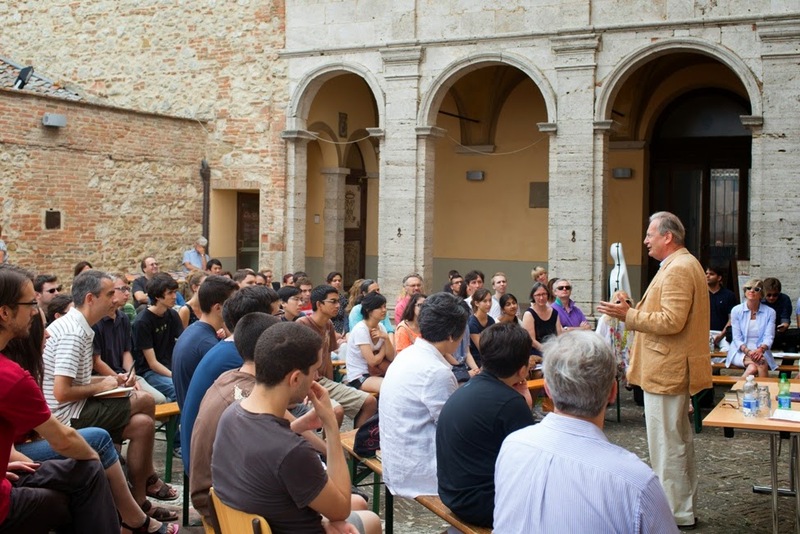 Any priest would be glad of the Utopian congregation - young and old, citizens of many nations and thence of the world - who attended Sir John Eliot Gardiner's Bach lecture in the courtyard of Montepulciano's Palazzo Ricci, home to the altruistic-sounding, Cologne-born European Academy of Music and Arts. This has been the main home for the various young musicians whose training and concert-giving have been at the heart of the festival Incontri in Terra di Siena: the International Menuhin Music Academy, students from the University of California, Los Angeles and - the ones I caught, and to whom my heart went out unreservedly - the Arab and Hebrew Israelis of the Polyphony Foundation based in Nazareth. 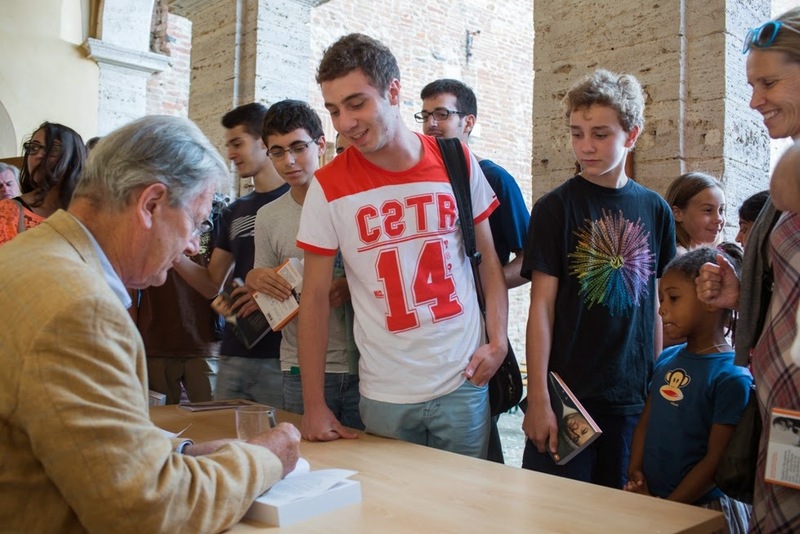 It's not my intention to write much about the festival here, except to point out that it owes its existence to that fine cellist Antonio Lysy, grandson of Antonio and Iris Origo whose Villa La Foce is the other centre of operations. My interview with the inspirational Ashkar brothers, violinist Nabeel Abboud and master pianist Saleem, will appear as an Arts Desk Q&A next Sunday, and a report of my festival slice around La Foce the following Saturday. JEG's special appearance was a surprise to me. It seemed to be there not so much as a successful attempt to flog the paperback edition of his Bach book - more on that below, pictured above in the second of three pictures by resident ITS photographer Paul Flanagan - as an education to the young musicians. They listened intently and afterwards asked lots of intelligent questions about vibrato and pedalling as well as staging Bach: an unwanted extra dimension, said JEG, once you bring in the alien apparatus of the opera house, it takes away from the experience. I'd agree with that, and I'd add that the director's imagination stops you exercising your own in a non-operatic drama. Pictured below, kids and adults (including the hugely entertaining Laurence Vittes from Los Angeles in the hat) along the colonnade from where I was sitting on the steps. Bach's current earthly representative is indeed an inspirational speaker, because he not only has the most profound performing experience of what he's talking about, but also the highest enthusiasm and love. All this was apparent in a documentary which marked a vital staging post on the road back to intelligent television arts coverage. I possess in handsome, beautifully produced hardback the book of which he was signing copies afterwards, Music in the Castle of Heaven, and though I've not done any more than dipped into it yet, my good friend Stephen Johnson has recently been inspired by it and made me move it near the top of the list. Both book and talk fulfil that essential function of making you either go to or immediately listen to key passages in the cantatas. I began my big Bach Sunday pilgrimage the January before this one, only getting up to Easter before my resolve to absorb and blog bit the dust, Even had I continued, I'd still not have heard all the masterpieces. JEG added more to my enthusiasm in his illustrations of Bach's astonishingly vivid musical-theatre instincts. I knew the splendid depiction of the calm at the eye of storm-tossed billows in the tenor aria from BWV 81, 'Die schäumenden Wellen von Belials Bächen', but not the last excerpt JEG played, from BWV 105. It instantly brought tears to my eyes - rather ready after being able to grieve for the world horrors of the last two weeks at the previous evening's concert given by the young Arab-Hebrew partnership in Citta della Pieve - with a wavering between major and minor anticipating Schubert. 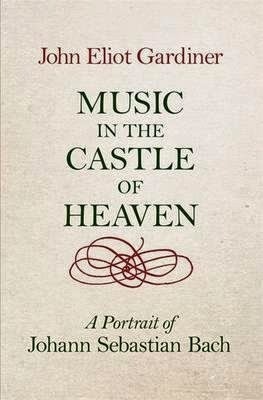 JEG writes in his preface: 'we want to know what kind of a person was capable of composing music so complex that it leaves us completely mystified, then at other moments so irresistibly rhythmic that we want to get up and dance to it, and then at others still so full of poignant emotion that we are moved to the very core of our being'. That last sums up for me the aria in question, 'Wie zittern und wanken, die Sünder Gedanken', oboe as soul, soprano as human, with only light string accompaniment. How could I have lived so long and never heard it? In that self-indulgent but not I think mawkish habit I have of choosing what music I'd like at my funeral, I decided on the spot that this would have to go in. If they outlive me, Debbie York and Lysander Tennant can conduct the dialogue; three solo strings will do for the support. But then, of course, I went to hear the whole cantata on YouTube, reeling at the rich, chromatic opening chorus, the distinctive bass recitative and the tenor's aria with rushing second violins, and decided that nothing less than the whole thing will do. Here's Herreweghe's performance, lovingly put up with printed music to follow and translation of the text. The soprano/oboe aria is at 6'17 but do listen to all of it. And since I mentioned Schubert again, let's have my current craze, a disc I can't stop playing: Sviatoslav Richter effortlessly emanating pure summer/country happiness in the A major Sonata, D664. This warmly recorded Tokyo 1979 performance is now on the bargain Alto label. Yes, I'm still buying CDs - though mostly Schubert and JEG's Bach cantata pilgrimage series. 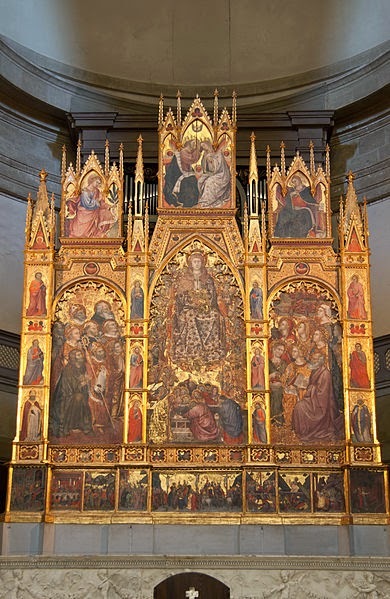 I was trapped not too unwillingly in the Duomo a few yards up the hill with Taddeo di Bartolo's lovely altarpiece. Umbrellaless, three of us made it through a relative break in the torrents to a cavernous ristorante where we sat down to bowls of piping hot home-made pasta in a cavernous ristorante , but lingered there rather impatiently as the downpour increased and rivers ran down the cobbled streets, flushing out some extraordinary large beetles which made our cicerona Nicky shriek but which I found fascinatingly beautiful. The storm lasted about four hours, after which we made our way to the Castelluccio Bifolchi near Villa La Foce for the Borromeo Quartet's evening Bartok epic, which isn't my concern here except to say that the spectators to the right of JEG in the first of my own three photos below are first violinist Nicholas Kitchen and cellist Yeesun Kim, his wife and a very radiant, calm-seeming personage, much like the present chatelaine of La Foce, Benedetta Origo. Yeesun is listening to music with eyes shut in the photo, not sleeping, in case you wondered. I had the serendipitous pleasure of this wonderful couple's company on the train to Florence, and a masterclass into the bargain, but that's another story. Let me just leave you with this Castelluccio - not to be confused with our beloved village of the same name at the head of the Piano Grande in the Sibillini mountains - in the evening mists at altitude after the rain. Locals said they'd never seen the like in July. The stupendous garden at La Foce to follow in time. One effort from Earth has been to send out a space craft with - as well as diagramatic information about our physical form, a note on e=mc2 etc etc - a recording of the complete works of J S Bach. "That" said the professor who launched the vehicle "will show them"
Love what David D has said about the memorial concert (and to David D--so sorry to have missed you on this visit to London. Hope there'll be a chance next time around). Perhaps, David N, the thing to do is have a celebration of life concert that includes all this beautiful music you've gathered on your list! 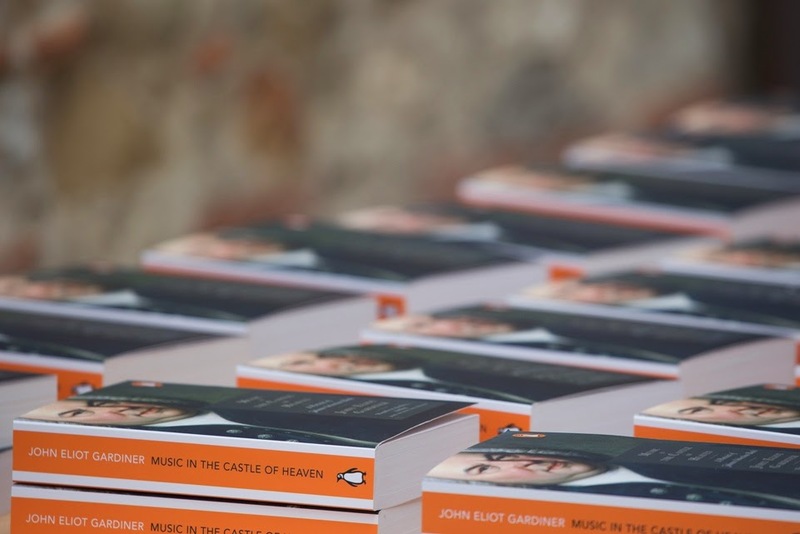 I went to put the Gardiner Bach book on my wish list, and wouldn't you know, it's already there. But I fear it will be a while as, while abroad, I finally got hold of the first volume of Linna's North Star trilogy--when I finish (no pun intended) then it's got to be on to the other two. Looks like you had yet another beautiful time in a beautiful place. I think of you always now when I'm in a church, trying to take photographs of the beautiful things I see. Only trouble is, in my case, I rarely know what they are . . .
A particularly alive and touching post David. What is it about picking one's funeral music? Perhaps the last chance to enlighten about who we really are/were, or wanted to be? Or even more likely a maturing analysis of ourselves for ourselves rather than a final statement for those left behind. David D refers, I think, to the Voyager spacecrafts ('a bottle in the Cosmic Ocean' - Carl Sagan, sadly missed) and the contents of the Voyager Golden Records. Voyager 1 has recently passed the heilosphere and is now in interstellar space. How small we are. How futile and petty our wars. We have discussed the complete works of Bach in outer space, Sir David, but I'm not sure you've put it in writing, so I'm glad for that. I wonder whether Vonnegut's Tralfamadorians would have the right receptors, though. Maybe I should have a dress rehearsal at which I can be present. It all depends on the nature of one's death, doesn't it. And ultimately a funeral service allows for total egocentricity. Must investigate the North Star trilogy, Sue. My own books to clear are Origoana (much enjoying Caroline Moorhead's biography, though atrociously proofed, and amazed by the parallels between every one of Mussolini's appropriations and Putin's, it's as if VP studied How To Be A Totalitarian) plus Deakin on nature. Wanderer - your last wise sentence makes me suggest two new books for your list, both by Christopher Potter. How To Be A Human Being is an anthology of religious and scientific wisdom wryly linked. And in which church? You have shown us so many beautiful ones. As to David D's which church and all the churches you've shown us, I say Amen! Perhaps what's needed is a roving concert, moving from church to church, perhaps accompaniment to a Norfolk churches walk! An easy choice - the centre of the 'village' in which I grew up, All Saints Banstead. Where I learned the most from any adult, from choirmaster David 'DAH' Harding, an inspirational mind; where my dear dad's ashes are placed in a box under the earth beneath the west window (and I think ma's will be too, though may that day be long off). Compared to many of the churches I've described, it's not a treasurehouse, though it has wonderful things about it, not least the massive west tower and a norman arch (a copy of Millais's Christ in the House of his Parents used to fascinate me, too). But above all it remains the hub of a community, means a lot to my mum - who still bakes cakes for the Open Door cafe in the nearby institute, where I performed in several cub scout gang shows - and still boasts the lovely orchard space now on the High Street which has been there since Norman times. But Sue's suggestion of an obligatory walk between Norfolk churches is also a good one...site-specific musical theatre, with an entertainment in each one. Anyway, don't burn or bury me yet! Oh good, Elizabeth. I'm always hopeful that people will listen to what I love, and much of it seems to have fallen on deaf ears recently, so I'm glad the magic worked for you. Just intoxicated by Rameau from Les Arts Florissants at a late-night Prom. He's my new love, though Schubert, Bach, Mozart and Strauss still have to be at the top of the list for a taste of heaven. I'm back again, to report that I have listened to the pieces you heard at the Proms, as listed on their website. I wanted to hear the same music you found intoxicating, and YouTube has all three, two of them performed by Les Arts Florissants. Hard to imagine all this beauty falling on deaf ears, for I am also enamored! I appreciate the website description, "music constantly poised between joy and sadness"; listening, even to a recording, is so emotional. Most of this Rameau is as new to me as it is to you, Elizabeth. I suppose I found the first two 'grands motets' a little ordinary by his own later standards, but the third is vintage stuff, contemporary - in its revision at least - with the operas. I'd also like you to listen to Sophie Rennert singing Dido's Lament at the end of the previous post, and tell me what you think, since no-one else has picked up on that yet - Sue has the hard copy of that wonderful concert - and I love your responses. Thanks in advance for that.